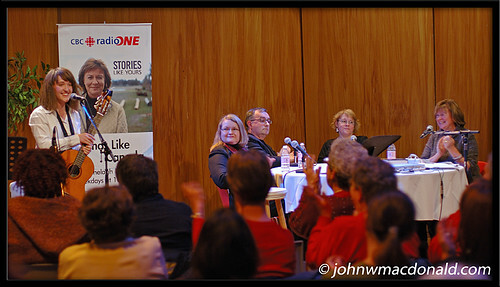 Shelagh Rogers in Ottawa, originally uploaded by johnwmacdonald. Canadian radio icon, Shelagh Rogers is in Ottawa this week. She hosted her radio show Sounds Like Canada in the CBC studio today. At the mic standing on the left is the young Canadian folk singer Kyrie Kristmanson. What an amazing, unique voice! She is up for the "Young Performer of the Year" award at the Canadian Folk Music Awards which will be held on Saturday December 1st, 2007.